When President Donald Trump imposed tariffs on imports of some of America’s closest allies of 25% on steel and 10% on aluminum, the decision was hailed by some but condemned by others. The president said he was imposing the tariffs because talks with the European Union, Canada and Mexico on issues like NAFTA and trade with European countries had faltered. In a statement announcing the tariffs, President Trump said he had agreed with an assertion by Wilbur Ross, the Secretary of Commerce, who linked steel imports to a threat to the United States’ national security. President Trump therefore used a 1962 law that allows the president to impose tariffs in case of national security concerns. Imports of steel and aluminum have been a concern to American manufacturers for a long time. Ten steel furnaces have closed since 2000, according to the Commerce Department, and eight aluminum smelters have shuttered or reduced their operations since 2015. The decision to impose steel and aluminum tariffs on Canada, Mexico and Europe came after the president’s decision to impose similar ones on China in early March 2018. What Is the Industry Response to the Tariffs? The American Iron and Steel Institute applauded the president’s moves, but the Aluminum Association warned that not all the aluminum needed by American producers can be manufactured in the United States. This was a concern echoed in other quarters. Even if production of aluminum and steel increases in the United States, it’s not possible to boost it enough to take the place of all the aluminum and steel American manufacturers import. The group, which represents aluminum producers and users in the United States, added that tariffs should be directed toward China rather than America’s allies. So how will this impact industries such as our own that rely heavily on the materials President Trump has put tariffs on? Some foreign leaders questioned the use of national security as a rationale for the tariffs. Canada Prime Minister Justin Trudeau noted Canadian steel and aluminum are used in American planes and tanks. He called the tariffs “inconceivable” and said labeling Canada as a national security threat to the United States was an insult. He insisted Canada would stand its ground in a trade war. European Trade Commission president Jean-Claude Juncker called the tariffs unjustified. What Effects Will the Tariffs Have on American Industry? The European Union has already replied with its own tariffs on U.S. goods, which has led a handful of companies, like Harley-Davidson, to move some production to Europe so as to avoid the tariffs. As for the effect on American business, there is both good news and bad news. The consulting firm Trade Partnership estimated that the new tariffs would create more than 33,000 additional U.S. jobs. That sounds like a positive move. On the other hand, the company also forecast that the tariffs could lead to the loss of 179,000 U.S. jobs in other sectors. Also, the CEO of the National Association of Manufacturers, Jay Timmons, said in an interview that the new tariffs could harm U.S. manufacturers. What Is the Impact on American Aluminum Companies? Overall, aluminum production jobs are a relatively minor segment of the American economy. There are roughly 161,000 Americans employed in aluminum production. But as noted, the Aluminum Association is concerned the tariffs will have an overall negative impact on the industry. Focus more on Chinese overcapacity in the aluminum sector. Target China and other countries that have a history of overcapacity and the evasion and circumvention of duties. Exempt important American allies like Canada, Mexico and members of the European Union from any duties or tariffs. Look into the concerns of the entire domestic aluminum value chain so the U.S. aluminum manufacturing in mid-and-downstream production does not fall victim to unintended consequences. Develop a monitoring system that would allow greater transparency of aluminum products that are being imported into the United States. Which Industries Are Most Affected by the Tariffs? Aerospace industries employ about 2.5 million Americans. Since it will no doubt cost more to make individual parts, the Aerospace Industries Association predicts the tariffs could impact the industry’s competitiveness worldwide. The American Automotive Policy Council also worries about unintended consequences of the tariffs and says they could place the U.S. automotive industry, which provides 7.25 million American jobs, at a competitive disadvantage in the global marketplace. Manufacturing and construction industries account for 17 million American jobs, including jobs in the die-casting industry. Increased costs will affect everything from refrigerators to beer cans. The result may be that more goods are made outside of the United States, which means fewer Americans will be hired to produce these goods. Caterpillar®, which uses steel and aluminum in many of its products. It is also being hit hard by the retaliatory tariffs imposed by China. Campbell’s® Soup. It is going to cost more for a can of soup in the future because going to cost more to make soup cans. Anheuser-Busch. Beer cans are made of aluminum, and they are now more expensive. Anheuser-Busch has already warned it may need to lay people off as a result. Boeing. Boeing is the nation’s largest single exporter. It uses a lot of aluminum in the planes it manufactures. Not only might the tariffs raise the price of those planes, but they may lead other nations to buy planes from companies like Airbus instead. DowDuPont. DowDuPont may need to move some production to Canada and Argentina if construction costs of new plants rise too much in the United States. General Electric. GE uses aluminum in almost all of the heavy machinery it manufactures, including jet engines, trains and power plant turbines. While Whirlpool received good news when President Trump placed tariffs on imported washing machines, it now faces the reality that it will cost more money to make dryers and refrigerators in the United States. 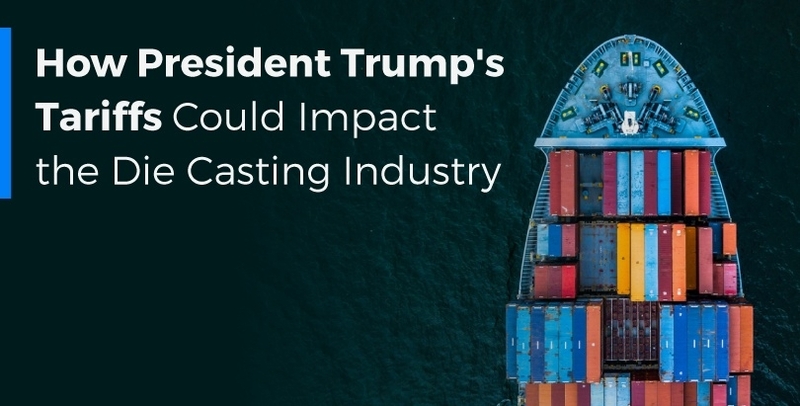 There is little question that the tariffs imposed on aluminum coming from Canada, Mexico and the European Union will have a direct impact on the die casting industry. As we noted, while aluminum producers in the United States believe they can increase their production to a degree, they do not believe they can increase it enough to handle all of the domestic demand for aluminum. This means costs for aluminum die casting will rise. Traditionally, aluminum casting can be done with lower costs than using other metals. These new tariffs may change that equation. They may also mean orders will take longer to fill as the aluminum needed for die casting may not be as readily available as it has been in the past. Some manufacturers are already warning they will need to find more cost-conscious alternatives to die casting. It is expected that the tariffs will have a big impact on downstream manufacturers, including prices increasing as the cost of aluminum rise rises. Many larger companies often have long-term contracts in place to provide aluminum, so price increases may not impact them immediately. Smaller aluminum manufacturers may need to raise prices sooner if they do not have long-term supplies in place. Regardless of what you think of the tariffs, President Trump took these actions to try to aid American manufacturing. The question is, has he applied these tactics in too arbitrary a fashion to actually aid U.S. manufacturers of steel and aluminum? Or will the unintended consequences of not being able to produce enough aluminum to make up for the total amount normally imported by American manufacturers result in higher costs for manufacturers, their customers and ultimately the American consumer? We don’t know yet. As for the question of whether the tariffs will lead to more or fewer American jobs, that is also an answer only time will tell. Initial signs are concerning but the full impact of the tariffs cannot be judged at this point in time. We will keep a close eye on how any additional costs may affect our manufacturing process and our customers. Please count on us to keep you informed and up to date. As a leader in the die casting industry, Premier Die Casting Company offers high-quality products and services that take advantage of state-of-the-art technologies. We work hard to be a responsive and reliable supplier of quality products at a reasonable cost to all of our customers. That includes tracking the impact of national policy on our industry and our customers’ industries. When you’re looking for the very best in die casting, contact our customer service representatives. They will talk with you about the needs of your company and help you facilitate and expedite the placement or tracking of your order using our Visual Manufacturing material information system. You can call us at 1-800-394-3006 or visit our contact us page, where you can ask questions or request more information. Next Next post: What Type Of Metal Should I Die Cast With?